This is Margaret Claire Hetherington Nicholl. I used to call her Grandmom, but she’d be Peggy to you. I post this picture of her somewhere on my social media every St. Patrick’s Day–in fact, I’ve probably written this post before. Because look at her. 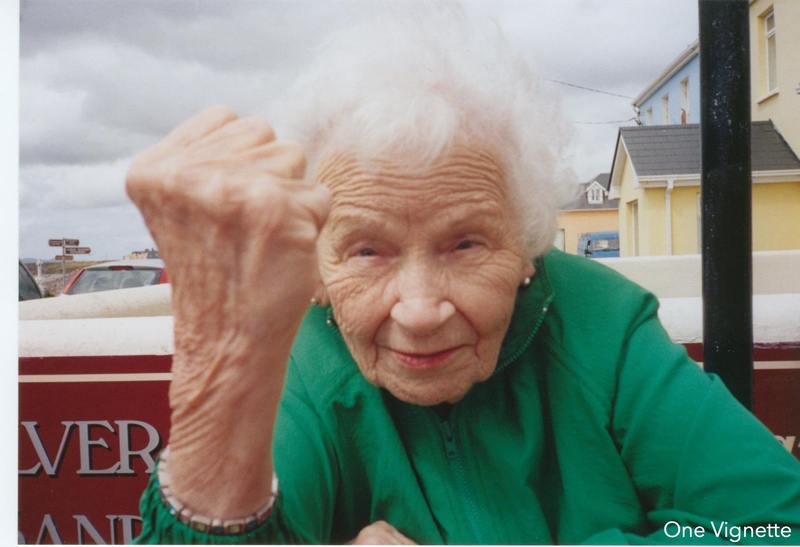 Just look at my grandmom, the west Philly girl sitting at a picnic table somewhere on the west coast of Ireland in 2004, threatening to give me a knuckle sandwich if I took her photo. I survived that moment–and somehow got away with a picture. Luck o’ the Irish, indeed. Sometime back in my early twenties, when I was just out of college and working at a legal publisher in Philly, my poor insecure self met up with my friend for a beer at Maggie O’Neill’s in Drexel Hill. The place was empty that evening, and we sat at the bar. I couldn’t afford to be out, but my friend and I were commiserating/celebrating/commemorating something, so I ordered a pint of Guinness, and was taken aback when the Irish bartender–older than I was, bigger–looked at me askance. “A Guinness? !” he said. His lilting accent made his following statement no less infuriating. “But that’s a man’s drink!” I told him to bring me the beer. He didn’t need to know that my knees were shaking under the bar. Peggy drank Guinness in Ireland, foregoing her usual vodka martinis (she always gave me the olives). She’d order just a half-pint of the dark stuff only to end up ordering another half-pint once she finished the first. No one told her she couldn’t. It wouldn’t be until later, when I was well grown, that I’d come to realize that Peggy had her own fears, and her own insecurities. But as a child, and later a young woman, I only saw the woman who sat as the matriarch of our family, telling stories and remembering songs and polishing off a plate full of food faster than even my dad could eat (she’d say that if I grew up in a family as big as hers had been, I’d have learned to eat before all the food was gone, too). She was the woman who’d wave a fist even with a hand that was old and frail and bony. This definitely isn’t your dreamy Irish day posting (I do enough of those), or a drunken one at that (because, old. I will go to a friend’s house tonight and drink approximately one beverage and need a nap). So, not typical. But check out that fist again and etch it into your memory. I’m going the spitfire route this year. Go be Peggy today, friends. Go drink that “man’s drink” and wave that fist and travel across the world well beyond your traveling years. Go do it. And may the lucky of the West Philly Irish be with you.